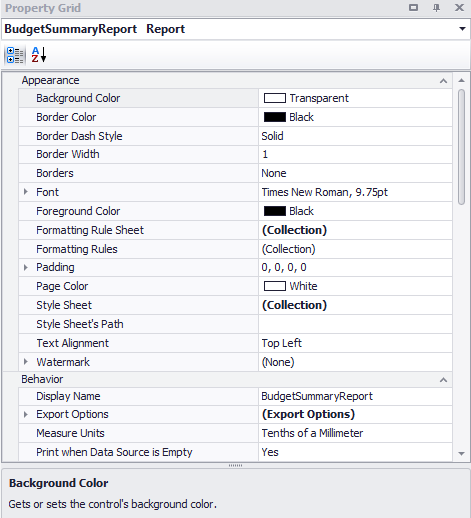 The Report Designer allows you to edit report templates. You can add or remove content and format it the way you would prefer. There is a huge array of customisable options, however for report integrity calculated data is provided and the report designer allows you to connect to this data rather than providing the ability to create calculated fields. The purpose of this manual is to cover the basic concepts, terminology and navigation of the report designer elements. More specific examples and step by step instructions can be found in the Customising Reports help note, however an understanding of this guide is advised to assist with terminology and concepts used in those support notes. Bands are displayed as grey rows in the report designer and are integral to customising and editing reports. 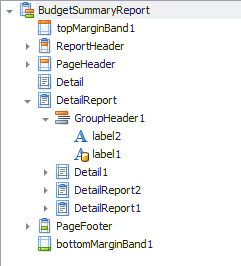 Bands divide the report into logical sections (such as footer, header etc.) and show us how the report will be laid out and how it will appear. The order that bands appear in the report designer is very important as this indicates the order that the report will be rendered. The bands also determine if they are displayed on repeated pages. For example, the ReportHeader band is displayed once and not repeated on additional pages if the report spans more than one page, while the PageHeader band will be repeated at the top of each repeated page. Controls are elements of the report that generally are added by the user from the Standard Controls toolbar. The most common controls include elements such as labels, table cells, picture boxes, lines, and shapes. These controls are used to format and populate the report data within the report bands. Pointer, selected by default and corresponds to your mouse cursor.Label, can be used to simply be text or you can bind data to it. The Report Explorer is a collapsible menu that displays all the bands and controls that you have in your report. The Report Explorer is another way to see all the controls that we have in each band. From here we can not only see all the controls, but we can also find out what controls are binding to data and what controls are not. For example, in the picture below we can see that label1 is bound to data but label2 is not – this is evident by the golden canister on label1 and the lack of a golden canister on label2. Binding data is how you provide dynamic output to a control such as the month the report is for or the individual data for each account. The month can obviously change depending on your report criteria and the account data is calculated and provided by binding data. The property grid displays and allows you to edit the properties of a selected control in your report. You can select the required control in the main report design layout, from the Report Explorer or using the drop down menu below the property grid title. The property grid is divided into six sections; appearance, behaviour, data, design, layout, and navigation. You can edit any feature in the property grid by selecting the feature in the property grid list, and editing the value that corresponds with that feature. Most features either have a drop down menu to make selection or three dots ‘…’ that indicate and advanced selection window. Clicking on ‘…’ will open a popup window for selection. Further, underneath the property grid is a description box. The description box provides a brief description of the feature that you have selected in the Property Grid. 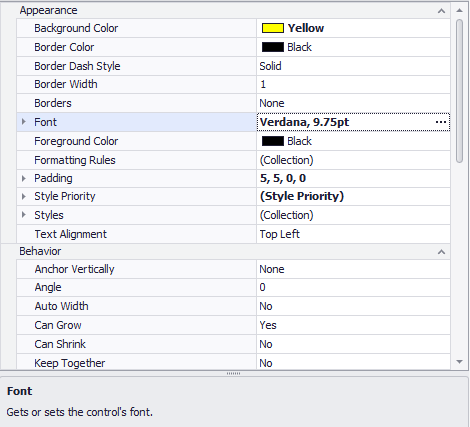 For example, in the image below we have the Font feature selected in the property grid, and the description box tells us that the Font feature “Gets or sets the control’s font”. The Field List contains all the possible data bindings that are provided for the Calxa template you are editing. For a full list of available fields in the Calxa report templates see the Available Data Field section in this manual. The field list is broken down into a collapsible menu dividing the types of data available. These sections include organisational information (including time frames for specific periods etc. ), accounts lists (includes data sources for all relevant values for the report), and business units (giving you the option to display business unit names, numbers, and the manager that owns the business units). An example of how data sources can be used in the report designer is detailed in the picture below. In the picture below we can see that two controls named Actuals are bound to the data source SelectedPeriod and LastYearPeriod respectively. Further, if you drag a data source from the field list onto a control it will force that control to bind to the data source, meaning that the control will display the values from the data source when the report is rendered. Text; this will change the text that is displayed by the control. If data binding exists it may be a combination of the data binding and other text. Data Binding; refers to the data source that the control will display when the report is rendered. Format String; this controls the format that the data or text will be displayed in. For example the number of decimal places to display and to display as a percentage. 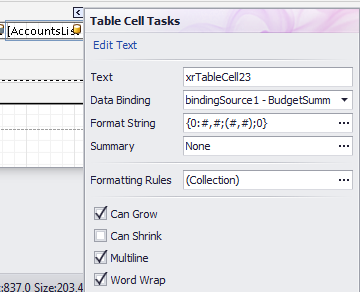 Formatting Rules; allows you to apply a collection of rules which control the format of a control based on some conditions. For example, display negative numbers in red. A list of the available data fields in the Report Designer can be accessed from the document attached at the end of this help note. As each report is restricted to a certain data set, you may only use the data fields available for each specific report. If you have suggestions for future data fields in report templates, please email your suggestions to helpme@calxa.com, along with the data field(s) you would like included as well as the report(s) that you want the data field to be available in.